I got what seemed like a brilliant idea the other day - a photo display wall to fill a vacant corner above my couch. But large photo walls are so expensive: custom framing, the art or photography on display, and usually a professional installer to hang them just so. 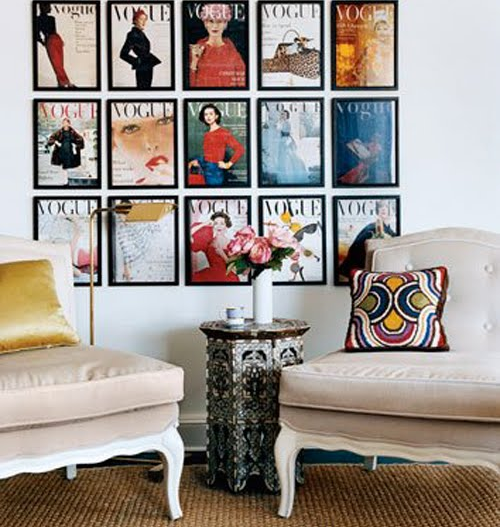 This Vogue vintage cover wall from Domino Magazine was a great inspiration. So what to do? My first stop was IKEA, king of inexpensive home accessories. Even if the frames weren't glam, a matching set always looks more elegant. IKEA Ribba frames at $10 a pop - including the mat! But what to put in the frames? I have years of fashion and shelter mag editorial and advertising tearsheets lying around, so I raided my stash to find a series of photos suitable for framing. The guidelines were to 1) find images in various shades of jade to pick up the green themes in my apartment, and, 2) to find them with as few words on the page as possible (editorials are best for this). After choosing favorites, I framed them up and laid out the photos to find the best arrangement. I settled on a mix up of home decor, accessories, and fashion images from over the years. Vogue had the best fashion options (of COURSE), but Town and Country takes the prize for absolutely gorgeous accessories shots (note the Tony Duquette brooch picture in the center). With a little help from the IKEA frame inserts, and a lot of measuring, I framed out the job. Tips: Be sure to measure the space between each frame too, so the distance is right. I then penciled in the exact spot for each nail hole on the paper, and drove the nail right through the paper, pulling off the wall papers when I was done. Easy peasy! The final result: ta-da - inexpensive photo wall! The set dresses up an otherwise dull corner (apologies for the window glare). Total cost? $120 for frames. $0 for old magazine tearsheets. Yay! I tried the same affect in my bathroom with vintage nature prints and a shell craft basket. Again with the glare. Sorry! Have you found a special trick for making great wall displays? First off, love your blog!! Secondly, wow! Have seen this picture before, but wow you did an awesome job! It looks SO expensive!!! Super awesome!! Great job, it looks fabulous using the fashion tear sheets! What a fabulous idea - perfectly executed!! I never seem to be able to get it exactly right - I'm always tweeking after the fact! I use a (3m, I think) vecro product - one part attaches to the back of the frame, the other to the wall. It means, once placed the frames can be repositioned but for our map of Paris framed in individual frames we spaced with a balsa wood spacer and used a level. 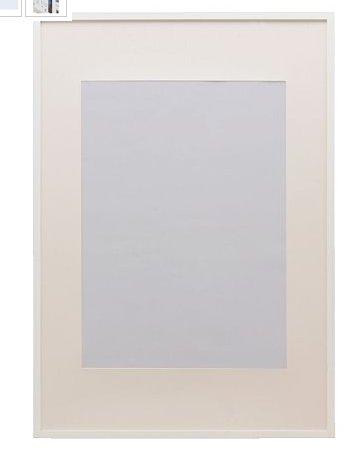 All our pictures, and we have a number of framed drawings and photographs, are "hung" using this Velcro system. No nail holes and no constantly making sure all are hanging straight. It really looks fantastic. I would not have pegged it for a bargain job. I want to do one with architectural prints on a very high wall in a two-story entry. The tutorial was helpful. Guess I'll have to get over the fear of heights first. Sigh... Luv it! So beautiful! That is SO AWESOME. 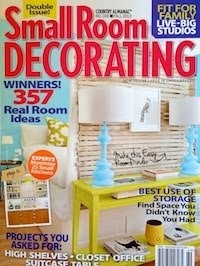 I love your idea to use magazine photos with a common color theme. Brilliant. We recently did a six-frame photo collage. To overcome the "lining up" issues, we attached all the frames to each other and hung from a single metal bar. They were IKEA frames, too. Looks really classy! It's fun to see some changes to your apartment. Hopefully the wall hangings stay up a bit longer now that the quake has come and gone.